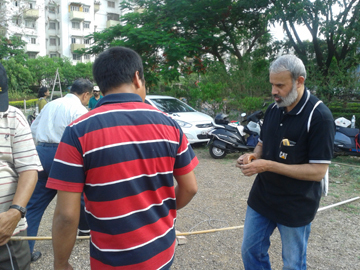 On 8th June 2014, ARSI had organised The National Field Day 2014. 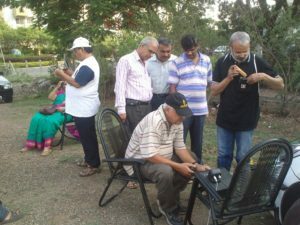 In our monthly HAM meetings OM Shrinivas (VU2MUA) suggested we do some activity to celebrate this day and the group decided to do a workshop on antenna tuning for HF bands on the field. Idea being, to have a tuned antenna for HF bands without special equipment like antenna tuners or analysers. We met on the evening of 8th June at the pre-decided venue at the QTH (short for location) of OM Ashok Joshi (VU2ASH) at DSK Vishwa in Dhayari Pune. 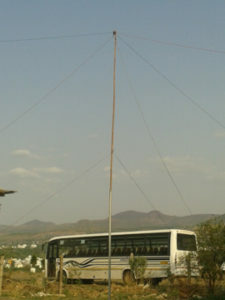 It is township located at the top of a hill in Pune off the Pune Mumbai highway. The rig for event was brought by OM Udaya (VU2UPQ), Wire, stakes, connectors etc. for setting up the antenna on field was brought by VU2MUA, we carried some more stuff like Pipes and bamboos to raise the antenna, couple of chairs to set up the station, water, and most importantly snacks from the Joshi Kaka’s QTH with some more help from OM Milind (VU2MSB) and yes, myself. Our plan was to first set up the antenna on the middle of the ground using aluminium pipe or bamboos and make an Inverted V Dipole. We started with first fastening a ready centrepiece for dipole on a bamboo, connected 4 elements of wire, 2 each for 20 and 40 meter bands. Elements for each band were cut at length calculated by the formula 468 / frequency = total length in feet. Total length being 66.5 feet for 7.050Mhz and 33.20 for 14.100Mhz. 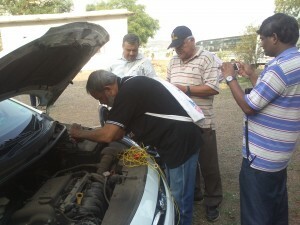 A field station was setup with a HF rig and SWR meter powered by car battery, by hooking it up the VU2MUA’s car. VU2MSB did that part of the job and in few minutes or filed station was up and roaring. After the station was up and running, it was decided to first tune the atennas for a good SWR (of close to 1:1) at the center of our working bands. With guidance from expert HAMS like VU2ASH, VU2UPQ and VU2MSB we took the elements of the antenna down and length was shorted to get a good SWR ratio for both 20 and 40 meters and the elements were again mounted. OM Vilas (VU2VPR) joined in the later half with his XYL (wife). He re-tuned his existing antenna with the help of findings achieved from these experiments and set the length oh his antenna. 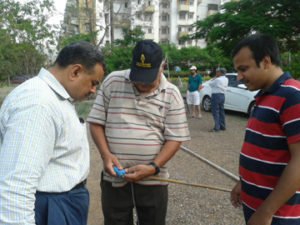 From Left – OM Vilas (VU2VPR) Tunning his antenna. OM Udaya (VU2UPQ), Om Srini (VU2MUA), OM Milind (VU2MSB), Om Ashok (VU2ASH – operating the field station/Rig). 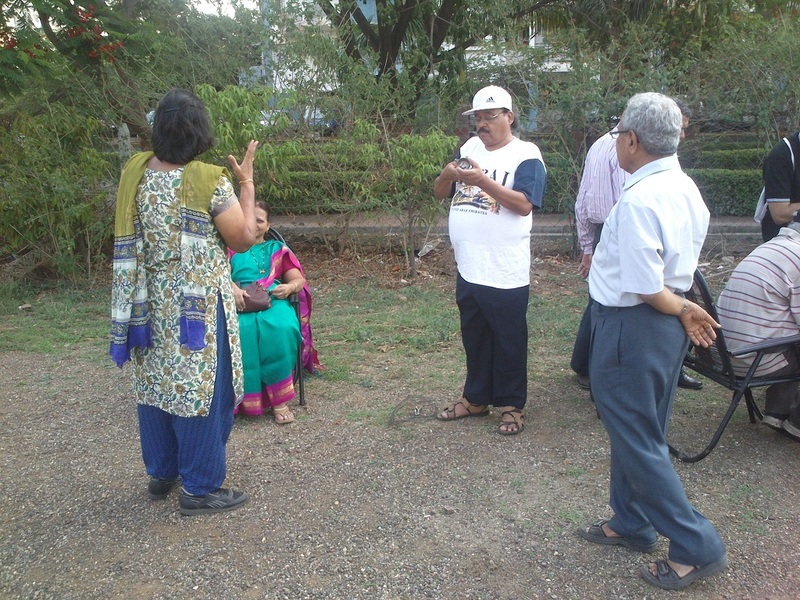 In the meanwhile, some residents of the township joined the workshop, some who were invited by VU2ASH & some passer by’s who came out of curiosity, to get to know more about the Amateur/Ham Radio hobby. Pratibha (Kaku) XYL of VU2ASH who is also a HAM (with callsign VU2AEI) attended to all the people who joined and enlightened them about this hobby and helped everyone with water and snacks. from left – XYL of OM Ashok (VU2ASH), XYL (sitting) of OM Vilas (VU2VPR), OM Vilas (VU2VPR), OM Avinash Khadilkar. At around 1900Hrs everyone decided to close the event. we took down the antenna, packed everything, Experts also took some time to discuss and help the attendees with info on Amateur/HAM Radio, how they can enjoy this hobby and take it forward and shared contacts details of each other for future communication. The event was ended after thanking everyone for participation and spcially thanking VU2ASH, his XYL VU2AIE for making all the arrangements, VU2MSB, VU2MUA, VU2VPR, SWL Amogh & VU2UPQ were also thanked for making the event a success. Just saw VU2AIE listed in this forum. That call sign belongs to me since 1998.